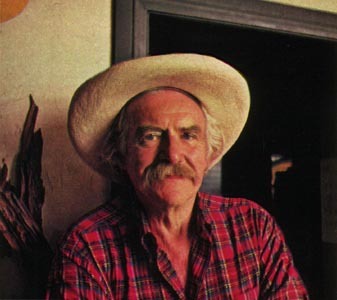 "Years ago," Will Geer is saying, "many years ago, I was acting in a repertory company in Ohio and I met Will Rogers and, of course, he liked me. I was playing a king. I prefer to play kings because you get to sit down a lot. Anyway, Will Rogers said to me: 'Will, why do you want to play all those kings and, counts and dukes? Play yourself. Life's so short that if you play yourself, that's enough.' Actually, that was good advice and now in The Waltons, for the first time in my life, I am playing myself. But my friends keep saying, 'Will, you old bandit, you ought to be arrested! Taking money for playing yourself!' "
And then William Auge Geer throws back his head, with the silvery mane, and unlooses a full-throated laugh. Once described as resembling " a road-company version of God," Will Geer is a robust 72 years old, a towering presence of a man who stands 6 feet-2 and weighs 230 pounds. As Grandpa Walton in CBS's The Waltons, he has hit the popular zenith of his career after more than 50 years as a traveling player in tent shows, repertory companies, river boats, the Broadway theater, movies and television. For the first time Geer is a national celebrity. 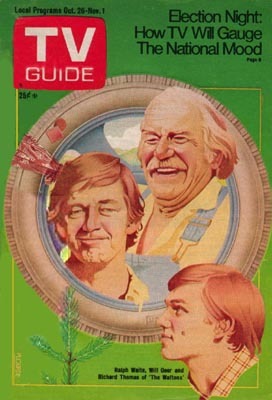 When The Waltons had its production hiatus last year, Geer, as he always does, packed his own company of players into a bus and hit the road, giving shows in the hinterlands until it was time to resume filming. He calls his troupe "Folksay America" and the yearly trek follows a tradition he started in the 1920s. "Last year, we were doing our show in a town in Arkansas," says Geer. "My usual program - Robert Frost, Mark Twain, Walt Whitman, some Woody Guthrie. I finished up with something Earl Hamner [creator of The Waltons] wrote for me on the history of the Walton family. I learned right there from the reaction of the audience - they didn't want me. Or Mark Twain or Walt Whitman. They wanted Grandpa Walton. "But I don't resent it," says Will amiably. "Without The Waltons I wouldn't have reached the public recognition that's taken me just about all my life. And for the first time in my life, I'm workin' steady!" As Will Geer looks back, names and events pop out from all directions, forming a literary and social history of the past six decades. He toured with Walter Huston, Ethel Barrymore and James Barton, among others. "I'm a folklorist," says Will, "which means I can't vouchsafe for every last picayunish detail of my stories. But they're mostly true-. Mostly." Typically, his stories bounce around the years with small regard for the niceties of sequential time. "I'm down in Mississippi with some troupe or other in the '30s," he says, "and I bumped into 'William Faulkner, who took me way deep into the piney woods where a black minister was practicing his sermon, shouting alone in a clearing. Well we started helping him with the sermon and we all got drunk on bootleg whisky, me and the preacher and Faulkner. "Another time," says Will, "I was in a play up in Connecticut and I met this woman who said to me, 'Will, I have a daughter with a hole in her head so big the wind blows clear through - poor girl wants to be an actress.' Girl's name turned out to be Katharine Hepburn. So I took her backstage 'and introduced her to Henry Hull, a fine actor with white hair, Katie just stared at him and then she said in that nasal Connecticut way she has of talking, 'My, you are an old ham, aren't you?' Henry was taken aback, but Kate was cool as the night wind. Afterward, Katie told me, 'Will, I'm scared to death of people. I always have to move in first for fear I'll be destroyed.' To me, she's a brat. I love her, but Katie Hepburn is still a brat. "Other day on the set," he breezed on, "one of the young actors asked me how it was when I was a young fellow, was it just as competitive then? Ha! I told him about auditions for 'Of Mice and Men' on Broadway back in the '30s. There was a line clear around the block, all young actors and we all looked pretty much alike except that they all wore clean white shirts and I wore a dirty blue shirt, which was all I had. "Now there's John Steinbeck himself sifting there in the front row, helping out with the casting. After all, it's his book they were dramatizing. He stopped me with a hard look and said, 'That boy looks as though he knows something about pigs.' What he meant was I had the rural look they were looking for. And that's how I got hired for 'Of Mice and Men' by John Steinbeck himself, thanks to a dirty blue shirt." Now he paused, but only briefly: "I'm a lifelong agitator, a radical. A rebel is just against things for rebellion's sake. By radical I mean someone who goes to the roots, which is the Latin derivation of radical. Helen Hayes calls me the world's oldest hippie. Some months back, Helen was doing The Snoop Sisters and I was doing a Bold Ones and we met in makeup at Universal. She said, 'Dear Will, what are we doing here at 6 in the morning? We should be out in our gardens, weeding.' Lovely, lovely woman." Geer says that his portrayal of Grandpa Walton is a blend of himself in his 70s and his own grandfather as he remembers him. "My Indiana boyhood was right out of The Waltons," says Will, who was born in Frankfort, Ind.. "Fishing in the summers. A Tom Sawyer time before the streams got all polluted. My grandfather had the white hair and the white mustache. He'd been a 49er, made some gold money in Californy and came back to Indiana to build the town's first opera house. We'd go for walks and he'd say hello to the trees by their Latin names. 'Hello, populus alba,' he'd say to a white poplar. 'Hello, quercus velutina,' he'd say to a black oak." Soon, young Will had his future planned - he would go to college and study botany. "I wanted to talk to the trees, too," says Will. "There's one thing I'd neglected to take into account. All actors are born showoffs. I was a showoff. I'd see Pearl White in 'The Perils of Pauline' and I'd lie on the railroad tracks and the girls would shriek. As the train came around the bend up ahead, I'd roll off the tracks in the nick of time." Will went off to study botany at the University of Chicago, where he was a classmate of Richard Loeb and Nathan Leopold, who were convicted of murder in a sensational trial of the '20s. "Because I knew Loeb and Leopold," says Will, "I was interrogated by Clarence Darrow, the greatest lawyer of the time. Interesting experience. His eyes looked into you as though you were made of glass." While still in college, Geer landed a job at the Blackstone Theater as an extra in "Lightnin'," one of the classics of the American stage, starring Frank Bacon. This led Will into a touring company with Mrs. Minnie Maddern Fiske. "A most formidable woman she was. Whenever I'd blow my lines, Minnie would stand in front of me, blocking my exit, until I'd ad-libbed my way out to her satisfaction. Taught me to think on my feet." Geer remembers when he was directing a stock company in New York in the late 1920s. Across the street from his theater, the first "talkie" opened "The Jazz Singer," starring Al Jolson. "We all went over to see this new thing called sound," says Will. "When the equipment broke down, we laughed ourselves silly. Two weeks later, our company had to disband. All of our customers were across the street, watching the talking picture. It taught me that in this business, one has to get used to change." Geer's ramshackle Hollywood home is full of theatrical memorabilia, including a small stage for the acting classes he teaches. He also runs an open-air theater at his bucolic compound in Topanga Canyon near the Pacific shore, where, still a botanist, he tries to grow all of the plants and flowers mentioned in Shakespeare. "At first," Will chortles, "they called us pioneers, then Bohemians and then hippies and now they call us conservationists." Married and divorced three times, Will has fathered two sons and two daughters, all in show business. Recently, he co-starred in a movie called "Silence" with his daughter, Ellen Geer, and his 10-year-old grandson, Ian Geer Flanders. "Three generations of an acting family," says the old iconoclast proudly. "That's the kind of tradition I like!"